A big trend in the kitchen design world right now are deep green cabinets. Dark and deep greens give off a earthy sophistication which we love. Below, we rounded up our favorite deep green paint colors for you. 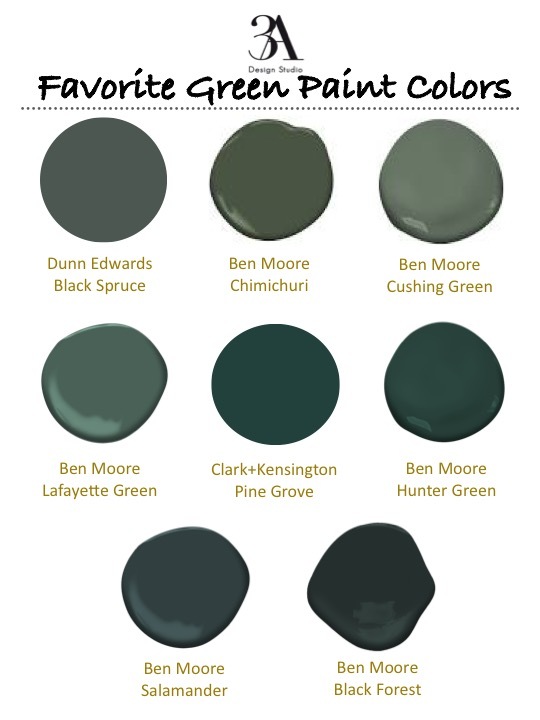 Do you have a favorite green paint color? At 3A we love adding natural textures to our designs. Whether it is a jute rug, woven baskets, or an upholstered leather piece, it adds interest and warmth to a space. One of my favorite natural materials that is a hot right now, is cognac leather. It is rich in color yet neutral enough to go with just about any design scheme. Not to mention, it is great material with kids as it can be easily wiped clean. A recent e-design we completed, which we incorporated cognac leather pillows. Here are a few inspirational rooms that have included a little cognac leather, along with, a few items to help you achieve the look at home. For the past few years gray, white, or two-tone cabinets have been all the rage. As we see in fashion, design styles fade for the next up and coming fad. In this case, enter natural woodcabinets. For the most of us, when we think of natural wood finished cabinets we think of generic builders grade cabinets that have a yellowish varnish to them. However, after seeing the kitchens below you may change your perspective. Here is another view of the same kitchen. The cabinets above are made from alder wood that have a thin gray stain applied to them, which warms up the cabinets while still letting the grain show through. The cabinets featured in the modern kitchen above and in the kitchen below are made from white-oak. With the right stain/finish, natural cabinets can look sophisticated and add a nice warmth. As we have seen in the images, works in all kitchen styles from traditional to modern. A new trend we are seeing more of are black fixtures used in kitchens and baths. This strong color adds contrast and a touch of drama, especially when against a white backdrop. The black finish accentuates the shape of the fixture and it becomes more of a statement rather than just a faucet. With a variety of styles available, ranging from minimalist to classic, anyone can incorporate the look. So, what do you think? Love it or leave it?